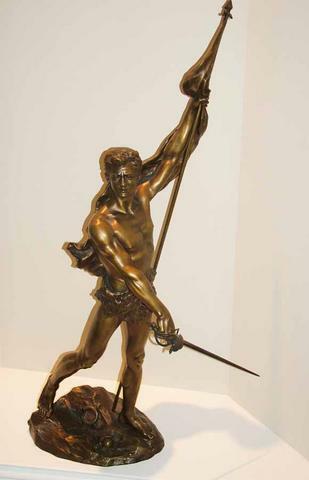 We are pleased to offer this scarce original bronze by renowned French sculptor Jean Jacques Fernand Hamar (1869-1943) perhaps best known today for his two statues of American Revolutionary War o General Comte de Rochambeau - one in Rochambeau’s hometown of Vendôme and of course the one in Lafayette Park in Washington DC that was dedicated in 1902 by President Theodore Roosevelt. Deaf since birth, Hamar studied under some of the leading French sculptors of the day for ten years at the Ecole des Beaux-Arts in Paris winning numerous medals at various exhibitions and eventually opening his own studio in Paris was a specialist in large commissioned memorial pieces. We believe this to be an early work as it was cast by the foundry of Emile Pinedo (1840-1916) who as a sculptor himself took over the foundry from his father in 1865 and was in operation from 1880 to around 1900 at 40 Boulevard de Temple. Noted for their rich polychromate patinas, the Pinedo firm cast works for numerous French artists who exhibited at the 1893 Chicago Exposition and the piece almost certainly dates from this period. The sword wielding, flag bearing figure is an allegorical "Victory" figure that is very finely crafted as detail photos below will reveal. Standing just shy of a meter tall, the sculpture will command attention in any setting and is in perfect condition.